When Texas comes up in a conversation most folks immediately think of Dallas or Houston, and musicians always extoll the virtues of Austin. Well, Steve Howell of Steve Howell & The Mighty Men hails from Marshall, Texas, which is a lot closer to Shreveport, Louisiana than any of these places. That is fortunate for us because his brand of American roots and blues music is flavored by the Sportsmen’s Paradise and the Lone Star State; it is the best of both worlds. Steve is an acoustic guitar genius and vocalist that was born in Marshall and raised in East Texas and Louisiana, which launched a career that was originally inspired by Mississippi John Hurt's magical finger picking. He kept up his music through a stint in the Navy overseas and after his service ended he played with artists and bands around Shreveport and his East Texas hometown. Yes, I Believe I Will is Steve Howell & the Mighty Men’s fourth self-released disc, and it is very special. Steve is joined by friends that he has been performing with for more than 20 years, including Chris Michaels on electric guitar, acoustic guitar and bass, Dave Hoffpauir on drums and Jason Weinheimer on the keys. This album is comprised of ten traditional and cover songs, and has a very natural acoustic sound to it. It was recorded by the band and mixed and mastered by Weinheimer, but do not think of this as a garage band project, as the production values are high and it is a very well-made disc. This set is not danceable nor is it something you will hear on the sound system in your local juke joint or roadhouse, but it is perfect for sitting back with your favorite beverage and just savoring the listening experience. In a day and age of over-processed commercial tunes, one hit wonders and cookie cutter instant hits, Steve Howell & The Mighty Men are doing work they can be proud of. The first track on the CD is “I Had a Notion,” a re-do of the song that Nick Katzman and Ruby Green contributed to The Best of Kicking Mule Record Inc. Volume One (this is required country blues listening). “Yes I Believe I Will” can be in the lyrics of this tune, and this laid-back mostly acoustic blues number will gives a good idea of what the rest of the album has in store for the listener. This is confirmed by the traditional “Keep Your Lamps Trimmed and Burning,” a 19th-century African-American spiritual that was originally recorded in 1928 by Blind Willie Johnson. Howell is a fine acoustic player and his interplay with Michaels’ distorted electric guitar is certainly mesmerizing, but even more striking is the honesty and genuine tone his hoarse singing voice gives to this powerful song. The harsh electric guitar solo might not seem like it would fit into this serious folk blues track, but it works out perfectly as it bridges 150 years of musical and social history. Those that are craving more blues will be glad that Howell included Nick Katzman’s “Devil’s Side” on this disc, though it is not entirely conventional. It is very slow paced and Weinheimer’s key have almost a circus organ effect to them. The glum lyrics build drama for inspired guitar work from Chris Michaels, making this one of the standout tracks of the CD. The band ends their set with a classy folk remake of a 1800s Irish tune, “Rake and Rambling Blade.” There is a marvelous texture of acoustic guitar and muted electric guitar with a tasteful banjo accent that fits in well with the somber lyrics that describe the life a no-good highway robber. This is the last piece of the mosaic that makes up this album, making it a complete journey through everything that is good about the American music of the south. 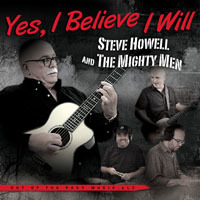 Yes, I Believe I Will is Steve Howell & The Mighty Men’s best work to date and if you are a fan of roots music, folk music or country blues it is a must-have for your collection. Even electric blues aficionados will surely find many things to like amongst the ten tracks this talented quartet put together. Listen for yourself and see!